Fifth on my list of countries that I would love to visit is Indonesia. After my trip in Kuala Lumpur, Malaysia, I headed to another ASEAN country. This time it is touristy and near the beach. 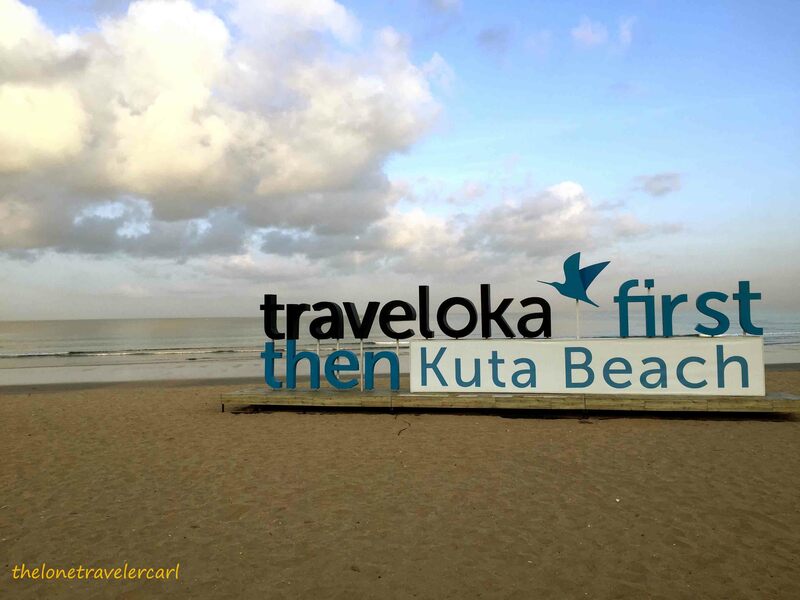 The place is also famous to a lot of beach and surf lovers but it is widely popular to most Australians. I went to Bali, Indonesia and I am so grateful that I have decided to come over. It was a great time when I was there and terima kasih wonderful Indonesia. Indonesia is a Southeast Asian nation made up of an archipelago. It is the world’s largest island country with numerous volcanoes. The capital of the country is Jakarta. Indonesia shares land borders with Papua New Guinea, East Timor, and the eastern part of Malaysia. 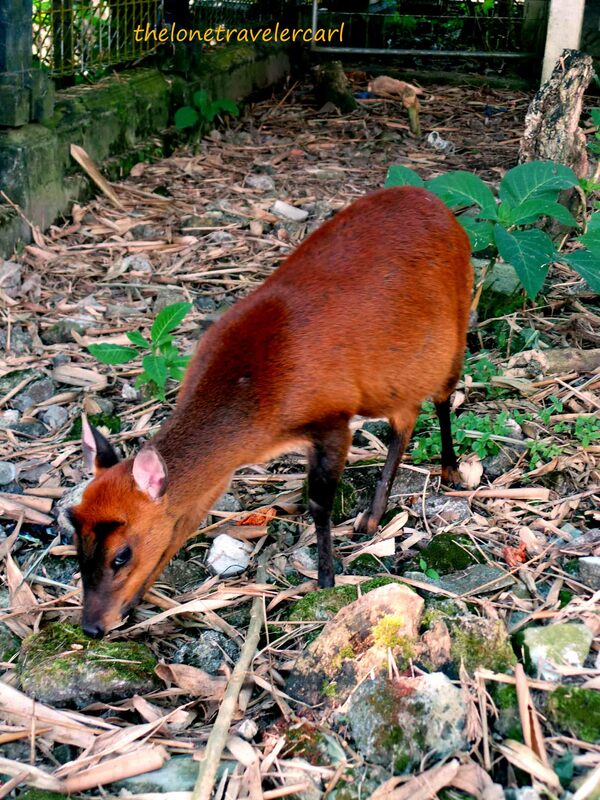 Other neighboring countries include Singapore, VietNam, Australia, Palau and the Philippines. It has 34 provinces and Bali is one of those. 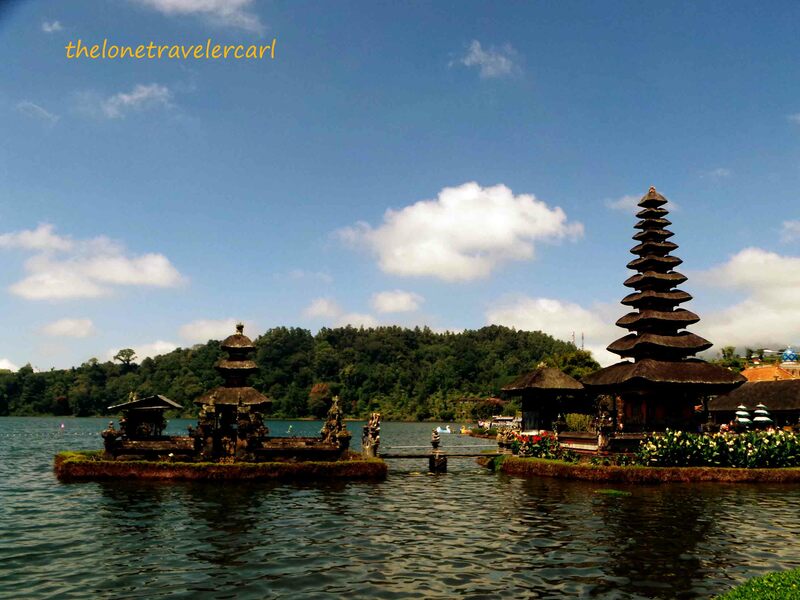 Bali is the most popular island holiday destination in the country. 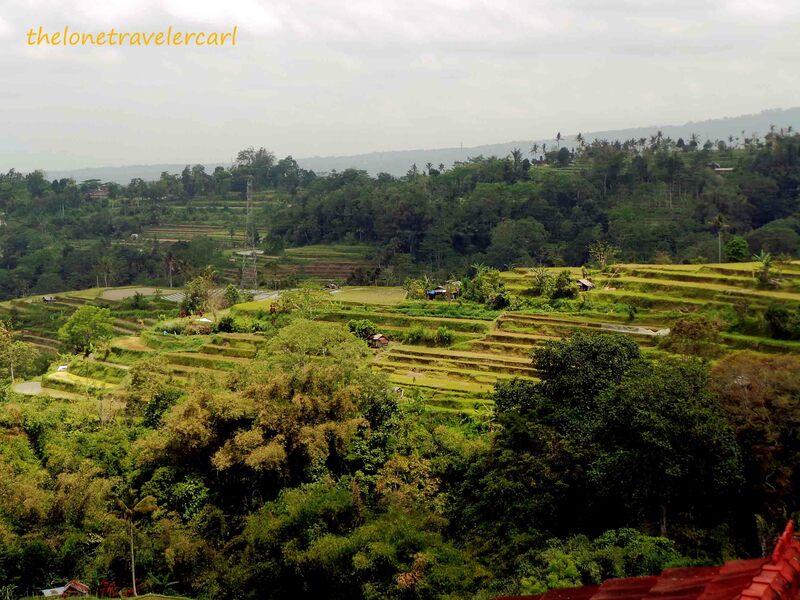 It has iconic rice paddies, beaches, temples and forested volcanic mountains. Flight from Kuala Lumpur, Malaysia to Bali, Indonesia took about 3 hours. I arrived in Bali at 2230H almost midnight. I went directly to the beach resort which I booked in advance. I was staying in Legian Beach area. The trip from the airport to Legian was about 30 minutes. When I got to the resort, finished with check-in procedure at about 2AM. Then, I called it a day and let my feet rest and shut my eyes. 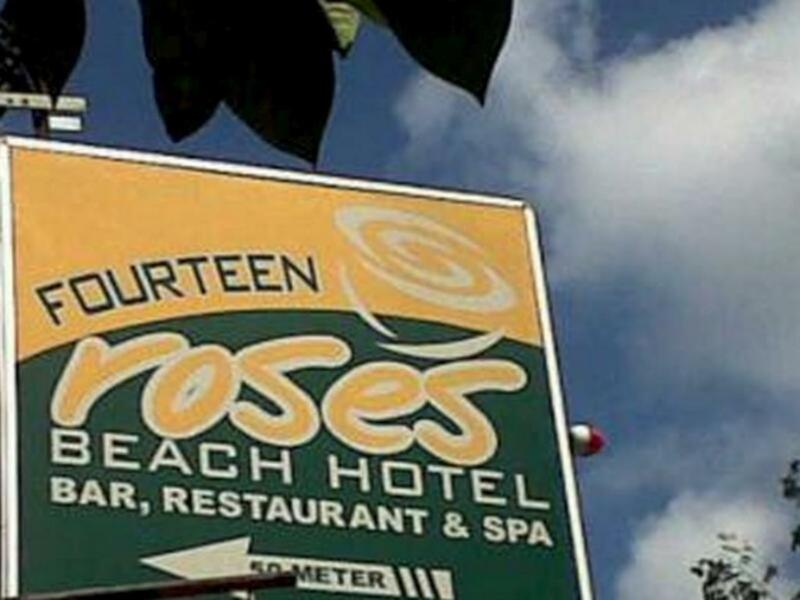 I checked-in Fourteen Roses Beach Hotel. 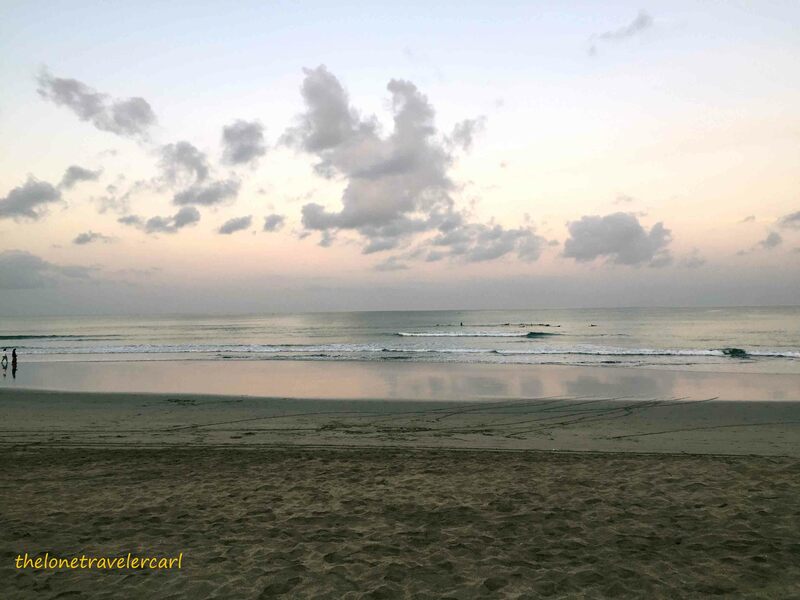 I woke up early at 0500H even though I only slept for 3 hours but I got to see the sunrise in Bali. 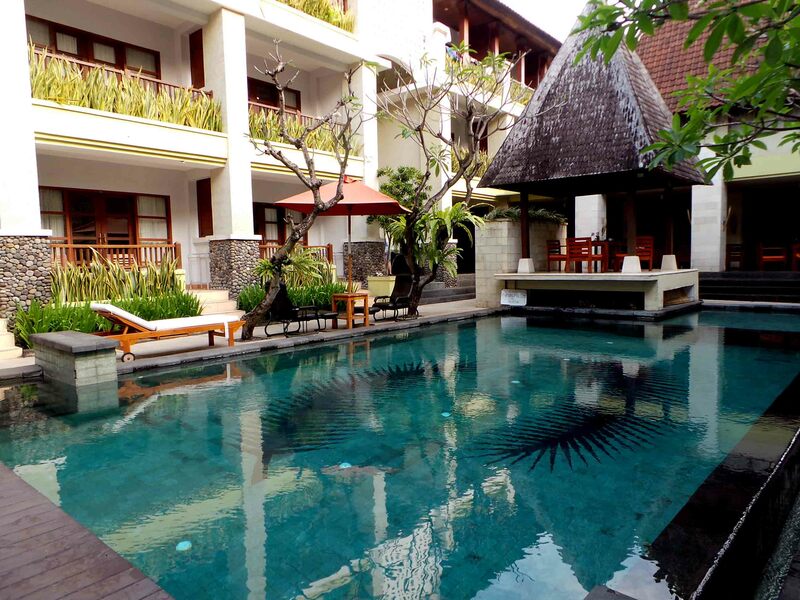 It was just a 5-min walk from the beach hotel to Legian Beach. I could say that I’m in Asia because I got to see the same sunrise I used to witness when I was still in the Philippines. The sea breeze was refreshing, the sand were fine to touch, the water was cold to the feet, the waves were relaxing, the view was splendid. It was a well deserved vacation. After the watching the sun rising, I headed back to the hotel for a free Indonesian breakfast. I took a rest in my room after that delectable breakfast and after an hour, I went out to explore the place. I was looking for a pair of slippers so, I decided to go to the nearest mall which is the Beachwalk. The Beachwalk was still closed when I got there. They opened at 1000H. 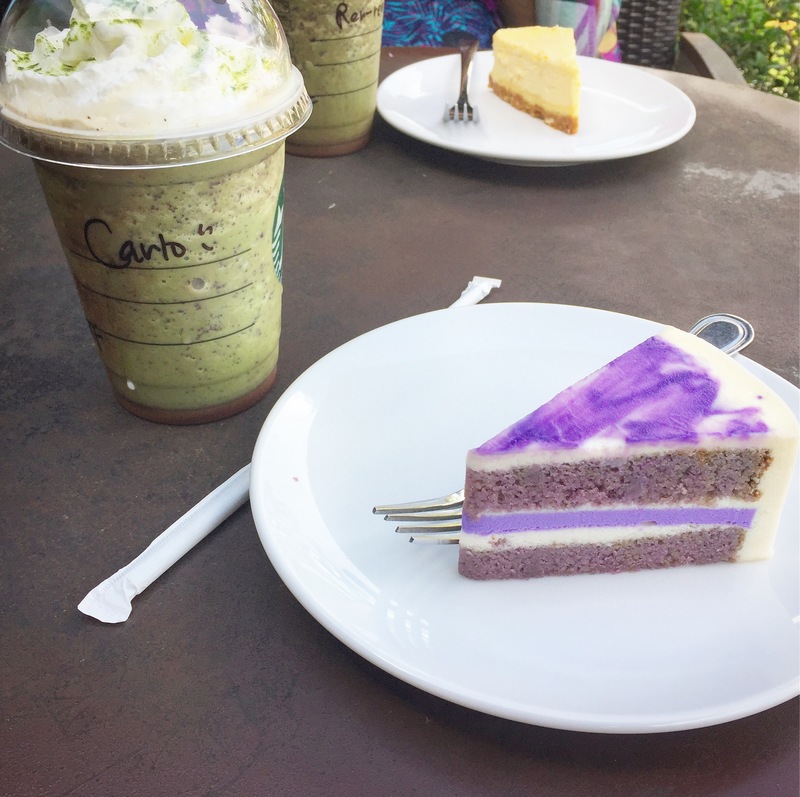 To kill the time, I sat and ordered some delicious dessert and drink in Starbucks. 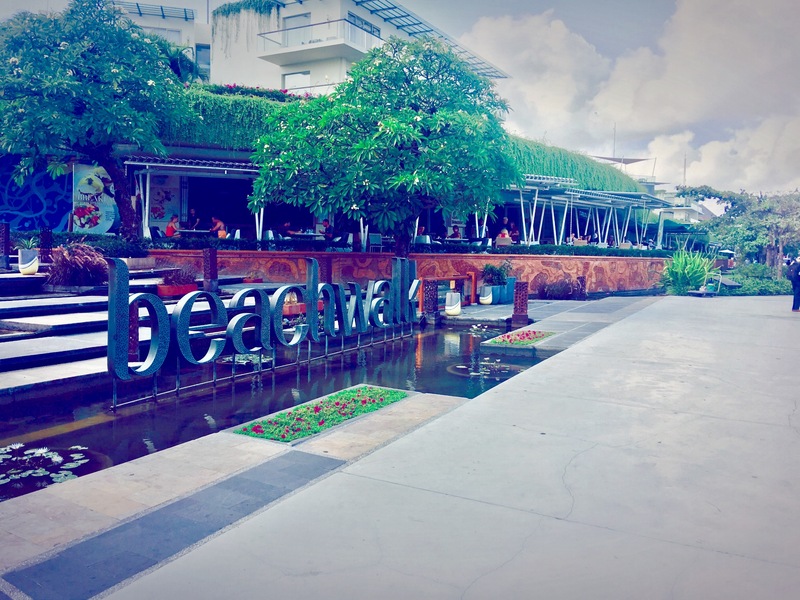 Few minutes, the Beachwalk opened and I strolled around. It was a decent mall but what caught my attention were the stores just across the mall. 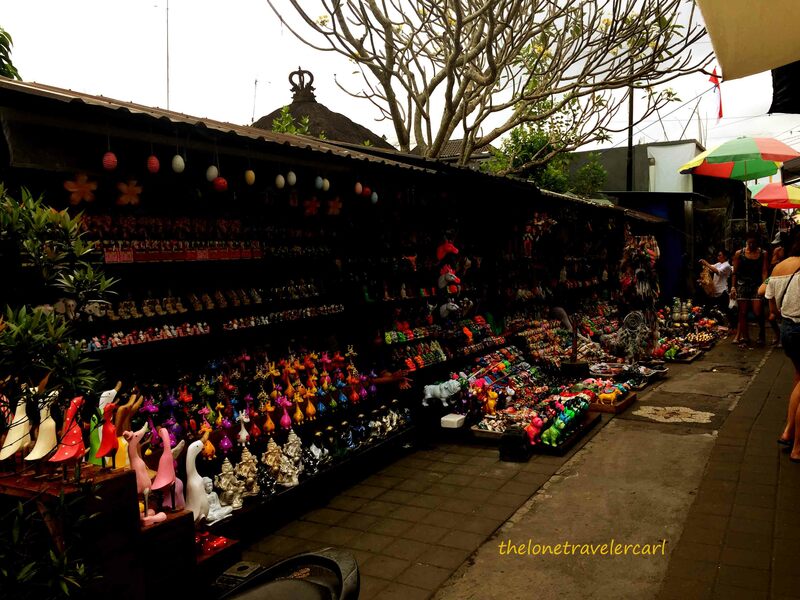 They were a lot of stalls selling Indonesian and Balinese products. 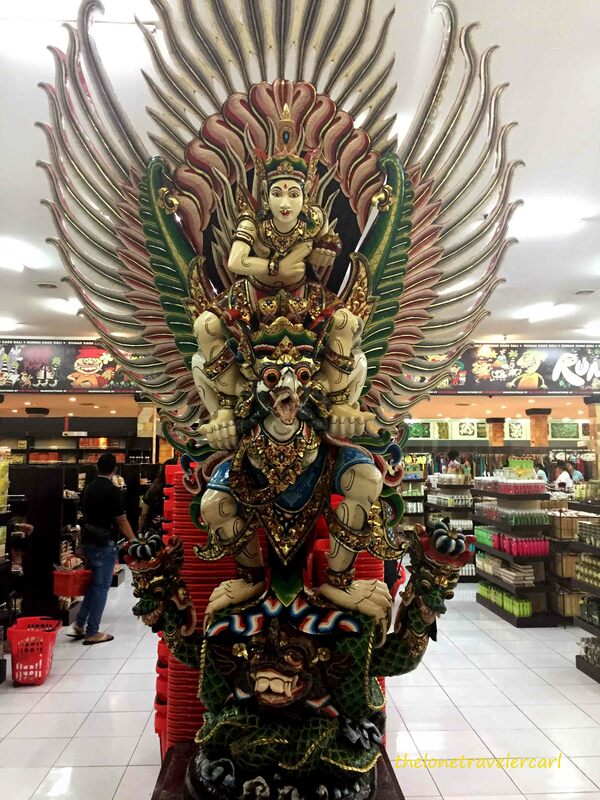 Since I am a frugal traveler, I bought some unique Indonesian souvenirs. After I was done doing my business at the stores, I walked back to the hotel and took a nap. The weather in Bali was humid and warm, it makes you sweat like a dog and makes you tired easily. 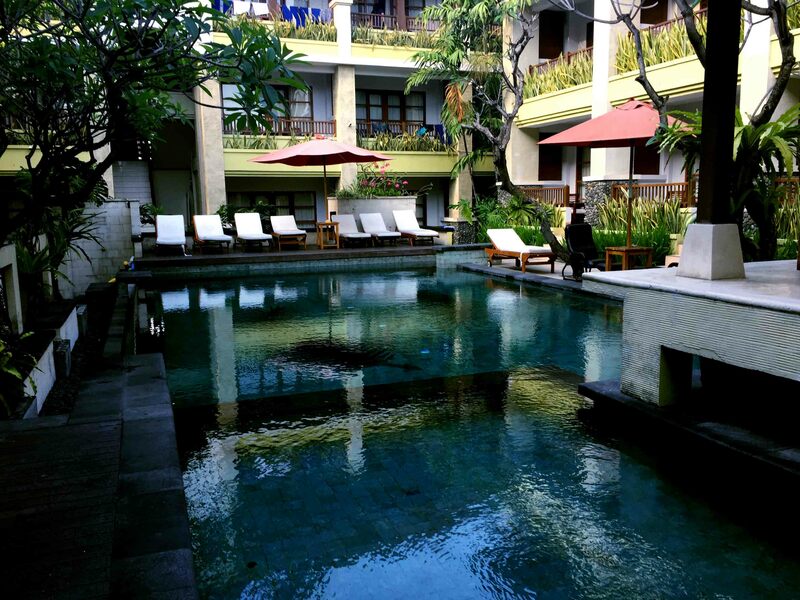 An hour after I had a nap, I took a dip in their enticing swimming pool. I enjoyed swimming that I didn’t notice the time that I forgot about dinner, so, I just had room service sent my supper. Then, I got some zzzs. 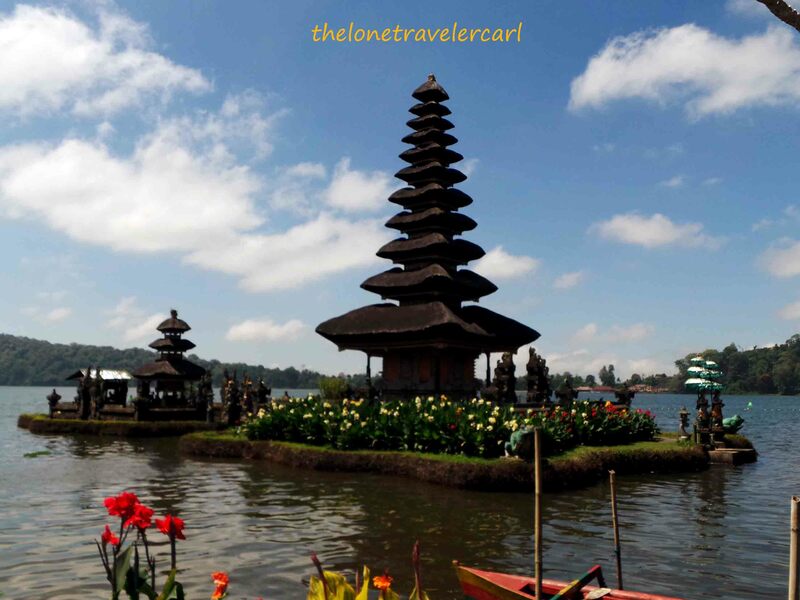 The next day, I got my tour to the northern part of the island province of Bali. The driver/ tour guide picked us up at 0830H. It was an hour or two drive to Bedugul from Legian. 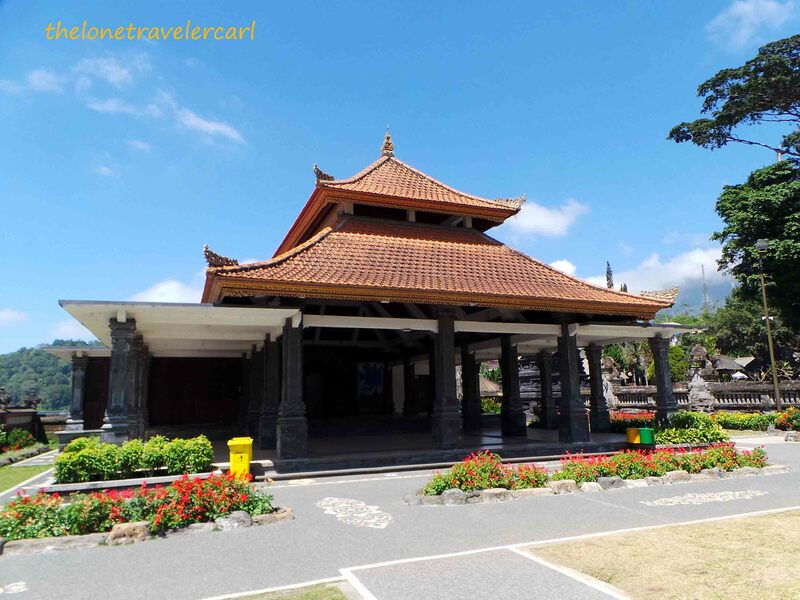 Bedugul is famous for its picturesque location. Much more added fame to the world is its water temple surrounded by mountains that has been advertised worldwide. 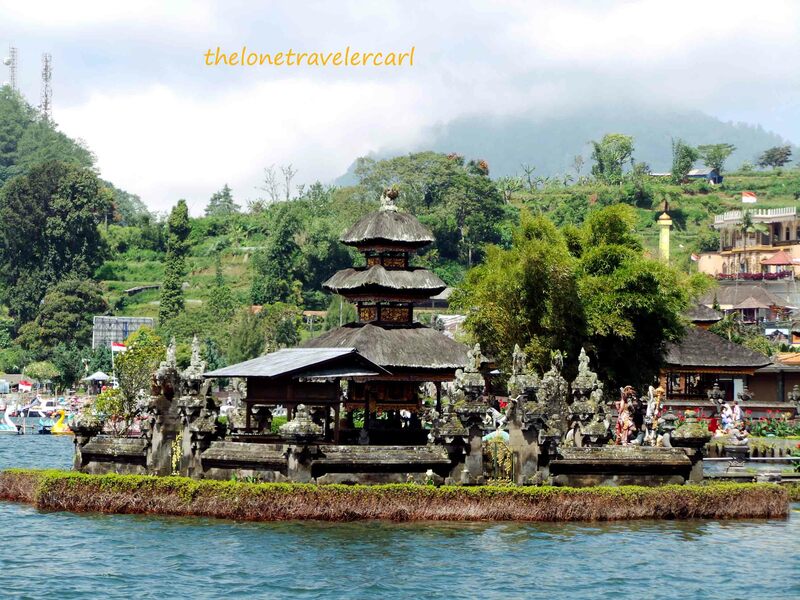 Bedugul is a mountain lake resort area in the province. It is located near Lake Bratan and enjoys the mild mountain weather which is cool. 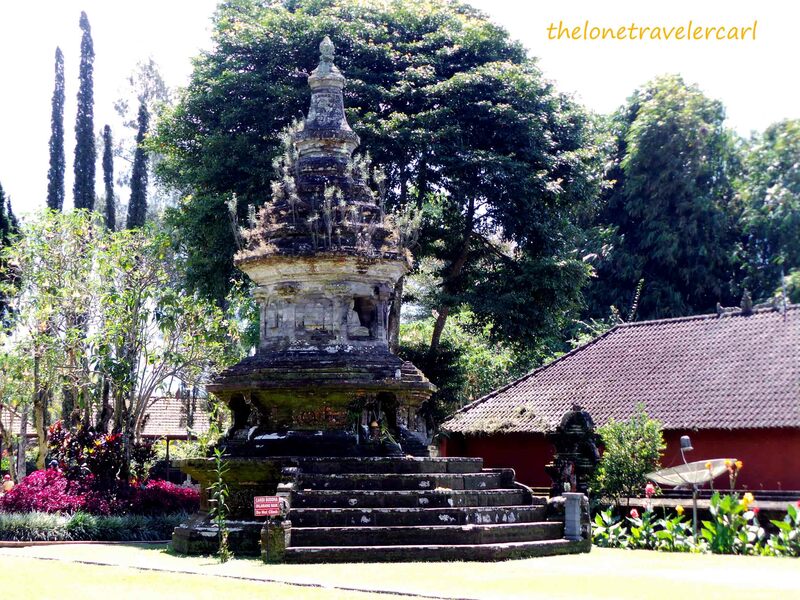 Major site in Bedugul is the water temple I was talking about. 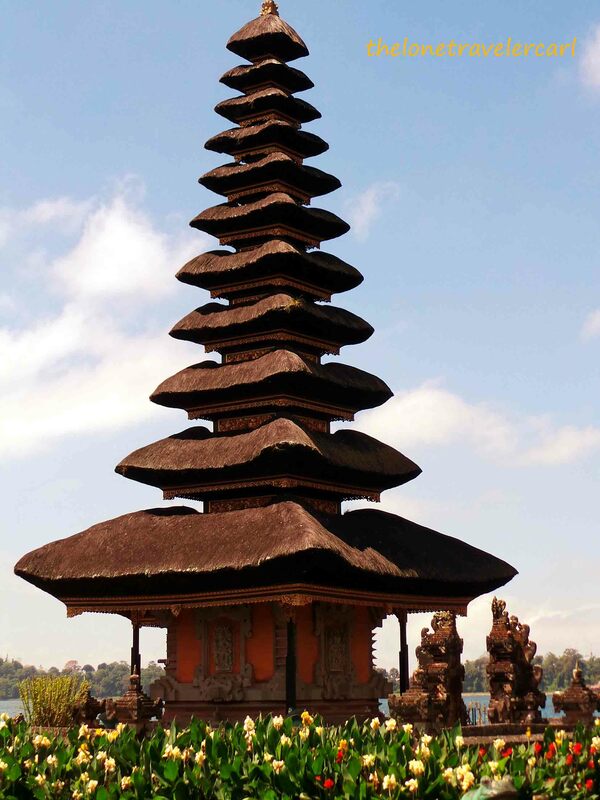 It is the Pura Ulun Danu Bratan. Pura Ulun Danu Bratan or Pura Beratan is a major Shaivite water temple. Shaivite or Shaivism is one of the major and oldest Hinduism sect that reveres Shiva as the Supreme Being. 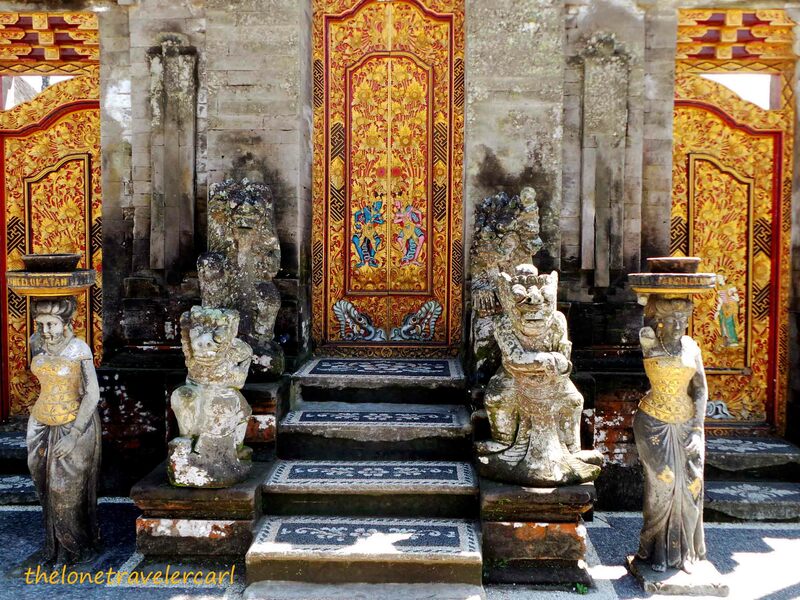 Pura Beratan serves the entire region and the complex is situated on the shores of Lake Bratan. 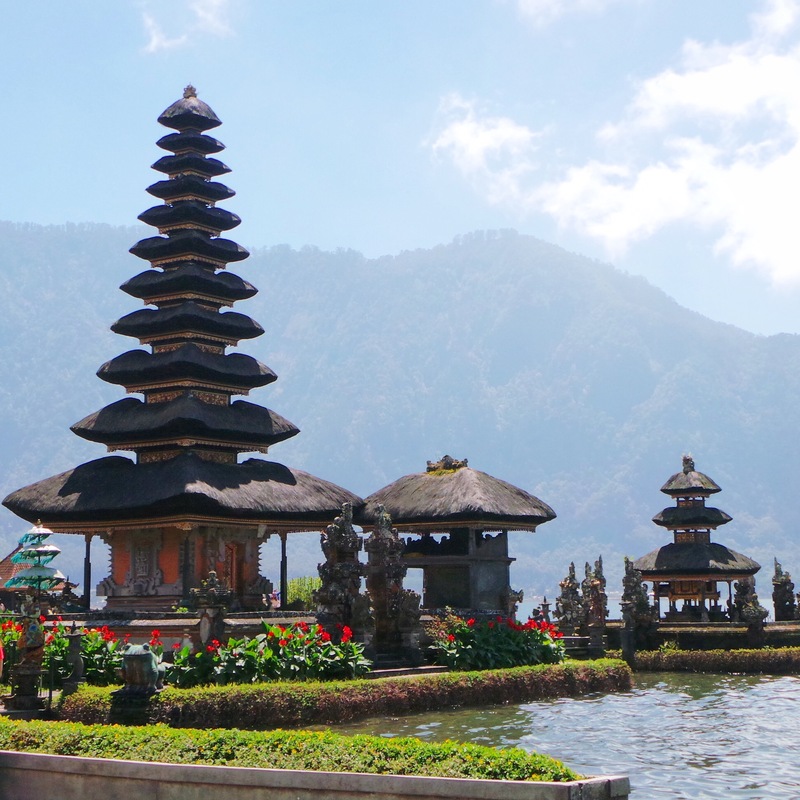 This water temples were built to used as a site for offerings ceremony to the Balinese water, lake and river goddess Dewi Danu due to the importance of the lake as a main source of irrigation in Central Bali. Lake Bratan is known as the Lake of Holy Mountain due to its fertile land. 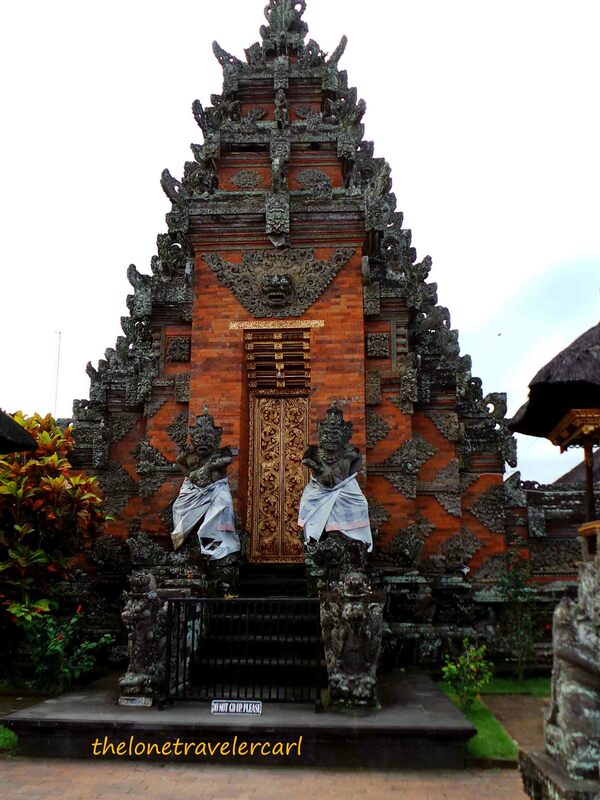 Pura Beratan showing 11 pelinggih meru as the principal shrine of the Balinese temple. We were in Pura Beratan for an hour. It was an amazing vista. Not only that, the coolness and freshness of the air were awesome. It was the main point of my visit in Bali. After getting some great photos of the water temple, we headed to this restaurant with the view of rice paddies. It was an all-Indonesian food buffet. 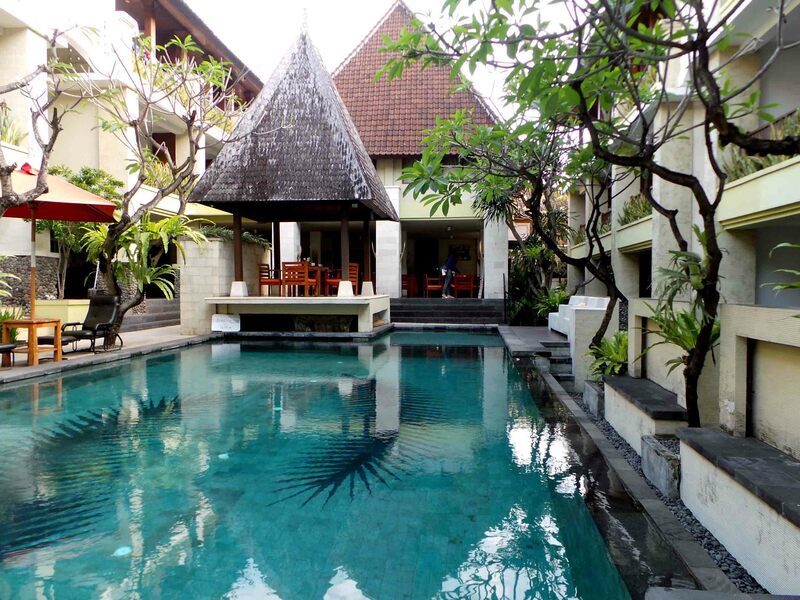 The name of the restaurant is Pacung Restaurant in Tabanan-Baturiti in Bali. After we had a delectable lunch, our tour guide/ driver sent us to another temple. 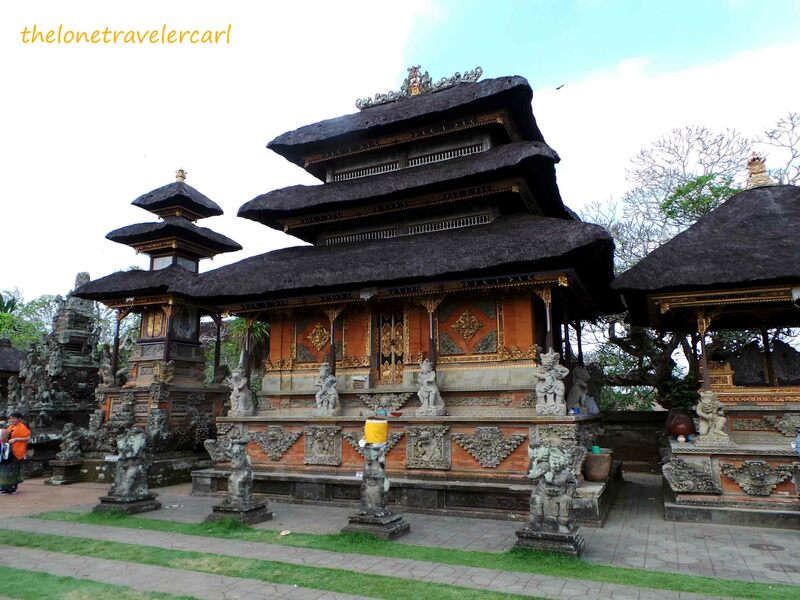 This temple is situated in Ubud, Gianyar Regency of Bali. 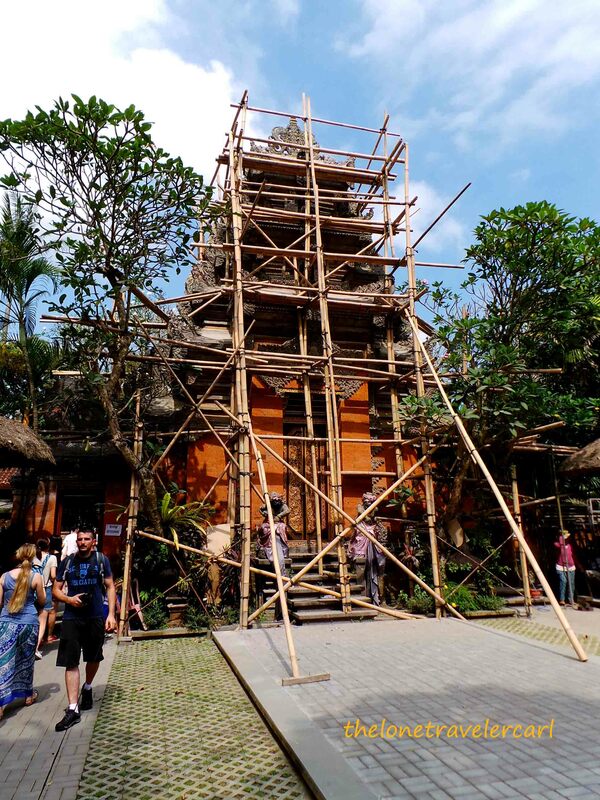 It is the Ubud Palace or officially called as Puri Saren Agung which is a historical complex. The palace is the official residence of the royal family. Unfortunately when we were there, the palace was under renovation. We left a little bit early since they were doing some remodeling. The palace usually hosts Balinese dances in the afternoon but Ubud is somehow distant to my hotel and there are more locations to visit so we can’t stay til the cultural dance. The next stop was another temple. The temple is located in Batuan. 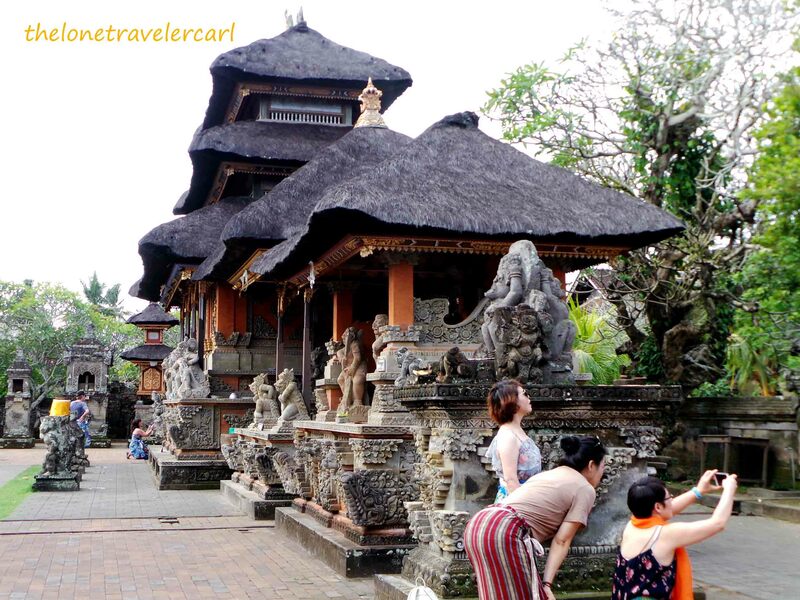 Batuan is a village and is noted for its artwork and style of painting and has since emerged as the major Balinese artistic style known as the Batuan painting. The village is known as the major painting center and contains a number of galleries and cooperative art societies which have played a key role in promoting Batuan art. 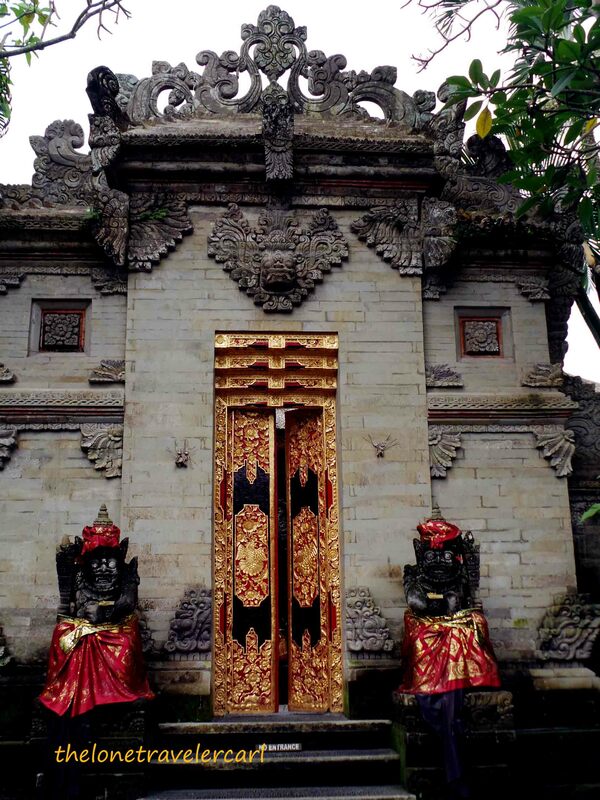 There are two major temples in the village, the Pura Puseh and Pura Dasar. 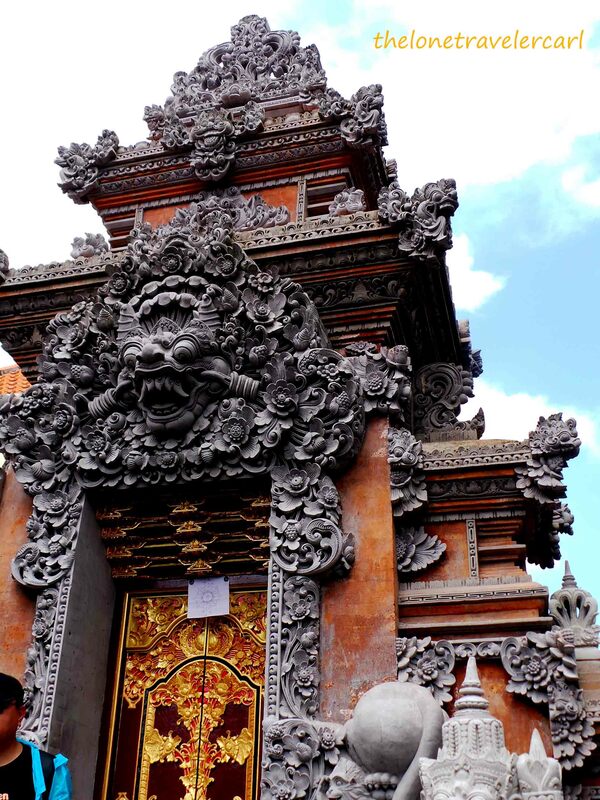 These temples are built in classical Balinese temple architecture style with elaborate carvings. 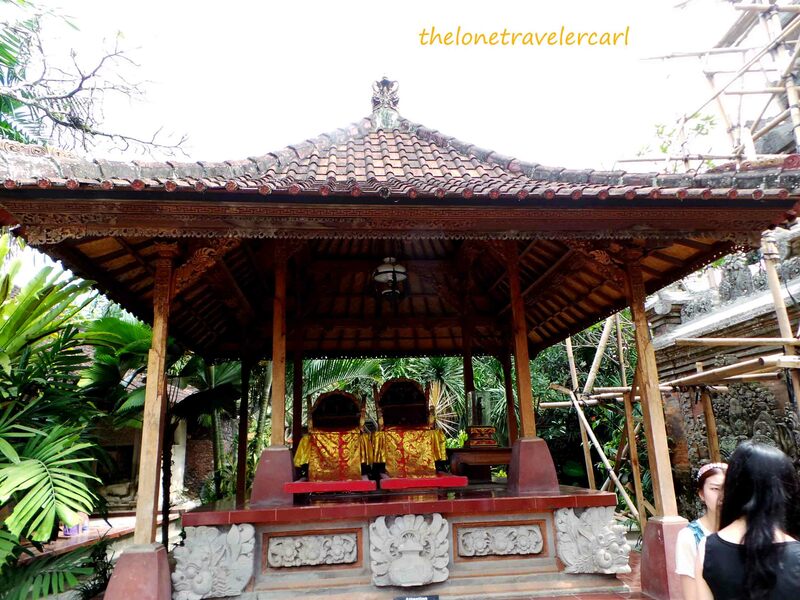 The Batuan temple area consists of a meeting hall called Wantilan where visitors can borrow from local people for ‘kamben’ which is a traditional Balinese costume. Every guests has to wear kamben to show respect and honor about the holiness of Puseh Temple of the Batuan village. The entrance is for free but they accept donation for the maintenance of the temple. 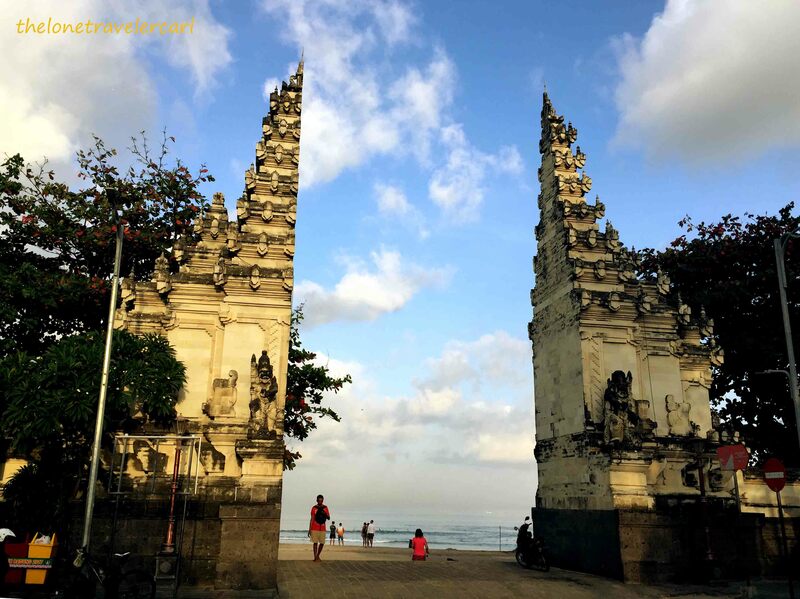 There are many stunning ancient relics from prehistoric sites that will show how Hindu culture influences Bali and these temples have been a place of worship both to their ancestors and worshiped Hindu Deities. Few minutes to almost an hour of touring the temple, we left the temple. We traveled on the road again and we had a few stops while trying to get back to our hotel. 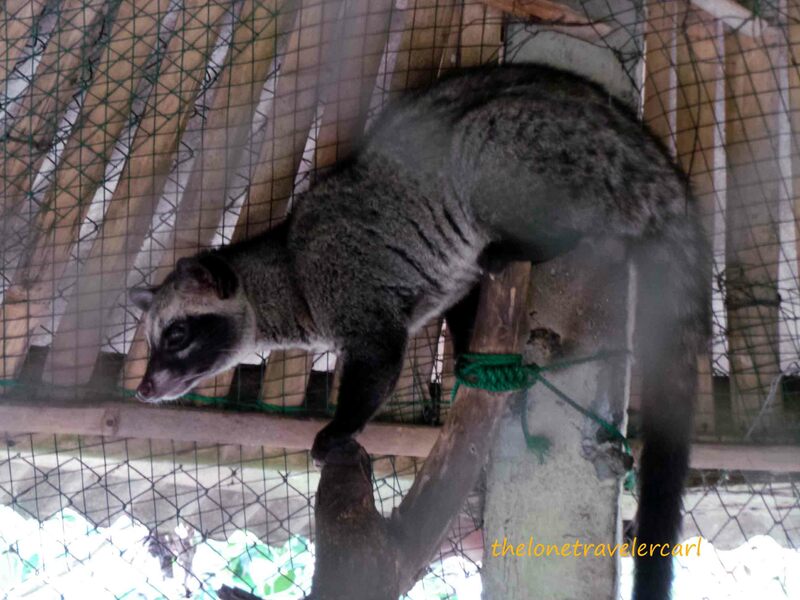 The strongest and famous Luwak coffee comes from this furry animal, Luwak. 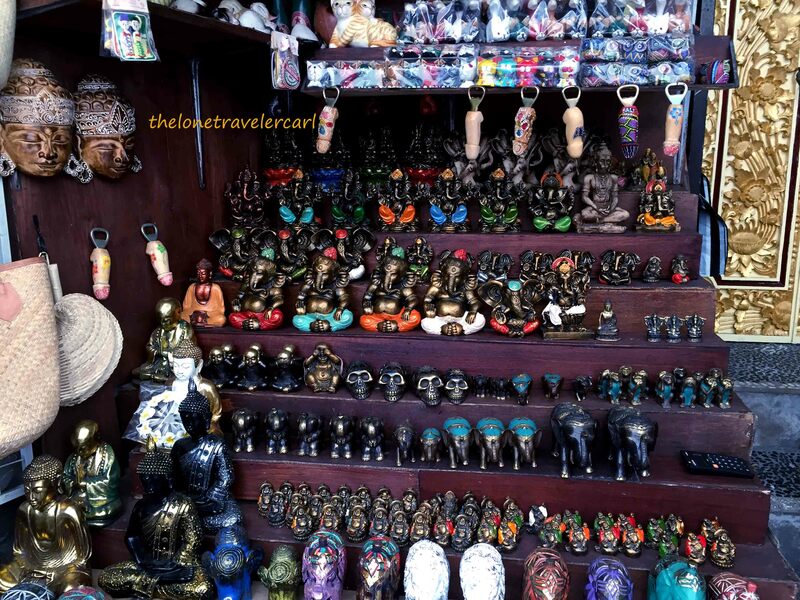 My Bali adventure was outstanding. I got enough rest and relaxation and on top of that, I also got to explore some part of the island. My temple experience was memorable and I took a lot of nice memories while I was there. 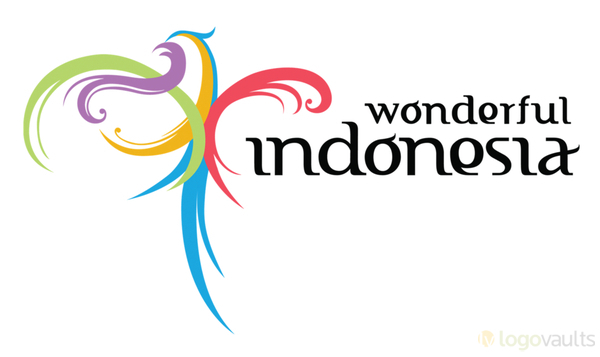 One thing I can say is terima kasih Wonderful Indonesia. It was indeed a wonderful vacation I got.